Now, this is another of my old books that I have been reading but obviously this one isn't YA. Now I love Historical Fiction. I have often been told that I was born in the wrong time period, so books like this really get me fired up and wish I was indeed living in the past. Welcome to a world of reckless sensuality and glittering sophistication . . . of dangerously handsome gentlemen and young ladies longing to gain a title . . . of games played for high stakes, including—on occasion—a lady's virtue. A marquess's sheltered only daughter, Lady Roberta St. Giles falls in love with a man she glimpses across a crowded ballroom: a duke, a game player of consummate skill, a notorious rakehell who shows no interest in marriage—until he lays eyes on Roberta. Now, this book isn't at the top of my list for Historical Romance. I am sure as I go through my shelves of books I will find the books that make up the top of my list and I'll let you guys know then. But as far as this book goes it kinda just made me super uncomfortable. 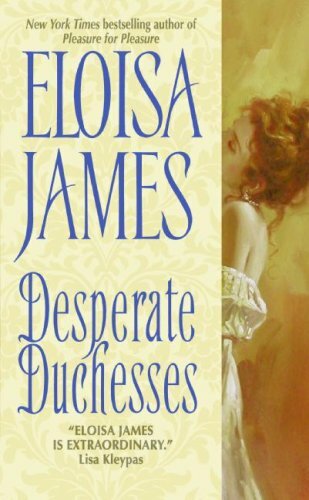 Now, it's been a while since I have read any other Eloisa James books (I'll def reread the ones that I have and get back to you with an overall opinion on them and see if this one was just a fluke). But this one def did not ring my bell. Now, I certainly believe in love at first sight, or extreme unwavering attraction at first sight (it happened to me so I have to believe) but in the case of this story it had me grinding my teeth. Roberta saw Villiers she was struck instantly by love, the reason for which seemed to be the cut of his coat, and I would be fine with that, I would even think it was funny if her whole basis for loving him were his outrages clothes, but it turns out the reason she fell in love with his was because he had total control over himself, and wouldn't embarrass her in public. That was not the impression I got from Villiers. I felt like he was not in control at all! He was this horrible crazy guy who wore embarrassing clothes and slept around with everyone. Then!! He wants to sleep with her "cousin" even after he proposes to Roberta. I don't know about you but even in that time period I would consider that pretty hurtful and embarrassing. I hated him, but he was supposed to be the bad guy so I guess that was well written. And the chess! I thought it was kinda cool how the chess was an integral part of the book and of the characters personalities. But I have known some pretty dedicated chess players (and even had to take chess lessons in school) but I have never met anyone as dedicated to chess as these people. I mean, no offense, but how can you only think of chess all day long? I can't even finish a whole game without being bored. But to each there own... there are stranger fetishes out there. I know the majority of my review seems negative but I did like this book as a fast read, or something to read on a road trip while your grandfather is blasting opera throughout the car (true story, that is totally how I read this book, not that I have anything against opera). Let me know what you think about it.